The Elad Group has picked up a trio of commercial units at the new luxury condominium tower it recently built with Silverstein Properties on the Upper West Side. 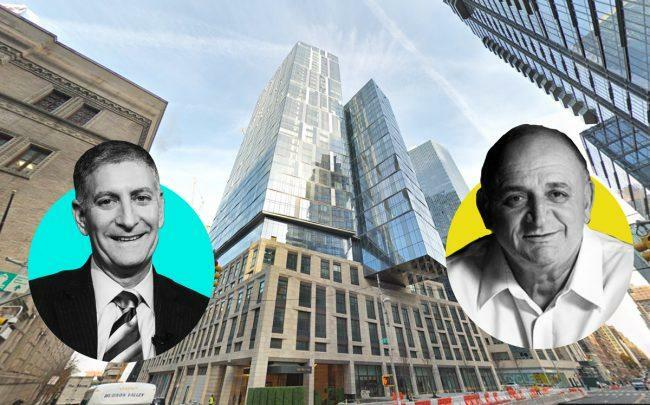 Elad, through several limited liability corporations, shelled out $51 million for the retail unit and two garages at One West End from the joint venture it has with Silverstein to construct the 43-story tower, according to property records filed Monday. FS CREIT Originator, LLC provided $38 million in financing. The entity is a subsidiary of FS Credit Real Estate Income Trust, Inc., a non-traded real estate investment trust sponsored by FS Investments and sub-advised by Rialto Capital. A message left for the Elad Group was not immediately returned. Silverstein Properties declined to comment beyond confirming that Elad acquired the units from the joint venture. Located at 11th Avenue and 59th Street, a few blocks from Lincoln Center, One West End has 246 luxury condos and 116 affordable rental units. The project, designed by Hill West Architects and Pelli Clarke Pelli, opened in 2017. In September, an entity that appears to be controlled by Nightingale Properties CEO Elie Schwartz bought a $17.9 million, 5,900-square-foot penthouse at the complex. And in January 2018, Touro College bought a 67,000-square-foot unit for $70 million for dormitory use. Douglas Elliman’s Fredrik Eklund and John Gomes, of Bravo’s “Million Dollar Listing New York” fame, are heading up sales for the residential units.